The fee seemed steep at 1,000 yen ($10 USD) but we made the decision, plopped down a few yen, and we were inside. 1,000 yen might look like a lot for a self-guided walk through an old garden, but it was some of the best money we ever spent on the trip! The gardens are open 9 am 5 pm. From Kyoto Station, take the Japan Railways (JR) Saiin Line to Saga Arashiyama Station. It is a fifteen-minute walk from there. After passing through this gate, you come upon the main building in the compound, the Daijōkaku. This is where Denjiro Okochi’s bedroom used to be and where he would spend most of his free time when he wasn't entertaining in the tea house. The house is known for being one of the best examples of traditional Japanese residential architecture. It combines many different styles of Japanese architecture such as shoin-zukuri and sukiya-zukuri. These architectural styles seem in direct opposition, the one being for large, opulent houses and the other, meaning literally, "a small space, simple and austere". The shinden-zukuri was a style of architecture that flourished in the Heian period. These buildings faced south, were comprised of a single story and were raised off the ground with wooden pillars. There was no tatami flooring, and the roof was made with cypress shingles. Sukiya-zukuri architecture is all about the use of slender wood elements and the simplicity of ornamentation. The grounds themselves take up about 20,000 square meters, and the guest pathway only shows you a small portion of the villa. One can only imagine what treasures are hidden amongst the rest of this estate. 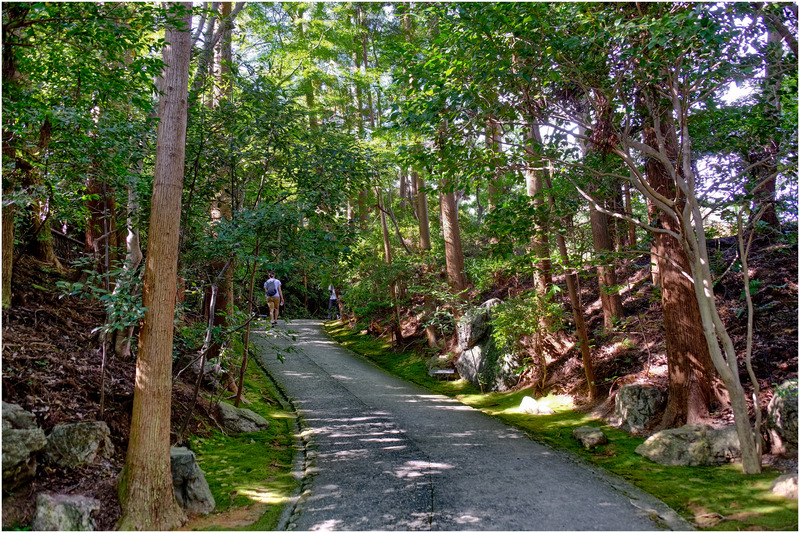 Throughout the stone path, you'll discover Buddha statues, water features and sculptures hidden in-between Cyprus trees and rose bushes. Hidden in the mountains, you can see a tiny temple, poking its head out of the trees. This is the Senkaku Senkoji temple. Its iconic coloured flags make it stand out amongst the green trees.